Anyone who has worked with clay knows how tricky it can be to create a ceramic work of art. Clay cannot be too wet or too dry. Glazes cannot be too thick or too thin. A kiln's temperature must be perfect. Contemporary Japanese artists' ability to conquer these challenges makes their works on display in "Hands and Earth: Contemporary Japanese Ceramics" extraordinary. The exhibition is now on view at the Crow Museum of Asian Art of The University of Texas at Dallas in the Dallas Arts District through January 5. "I think 'Hands and Earth' is a beautiful example of the very best of what can be achieved at the highest levels when you master air, fire, water and earth," Amy Lewis Hofland, the museum's director, said. The exhibition features many works from the collection of Carol and Jeffrey Horvitz, offering an in-depth selection of Japan's most talented ceramicists. Of the 35 artists represented in the exhibition, seven are considered a "Living National Treasure." "It's a title that's bestowed by the Japanese government to these artists to express that they are at the top of their discipline," Dr. Jacqueline Chao, the museum's senior curator, said. Labels describing the works are marked with "LNT" to indicate this special designation. Included in the exhibition are the works of several female ceramicists. Until the 20th century, men have dominated the field of ceramics. This exhibition highlights women's approach to nature. Shingū Sayaka's significant inspiration is flowers. 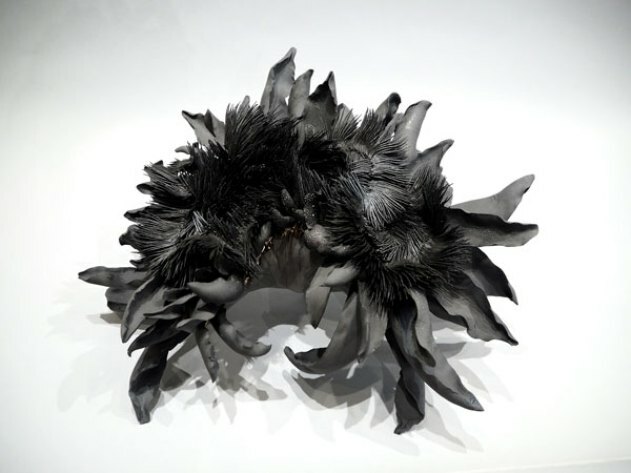 Her floral sculptures are fragile, dark and seductive. "This piece is incredibly delicate. It's very hard to believe this piece is ceramic," Chao said. "She doesn't do color. She likes to keep things more monochrome and that's because she's more interested not so much in the vibrancy of florals, but the passage of time." Several pieces represent artists' modern use of traditional glazes like the celadon glaze, an aqua-colored glaze invented in 12th century China. "A celadon glaze is very difficult because to get this perfect blue-green color, it requires many firings to achieve. One piece takes 8 firings to accomplish," Chao said. Contemporary artists combine the traditional glaze with modern forms. 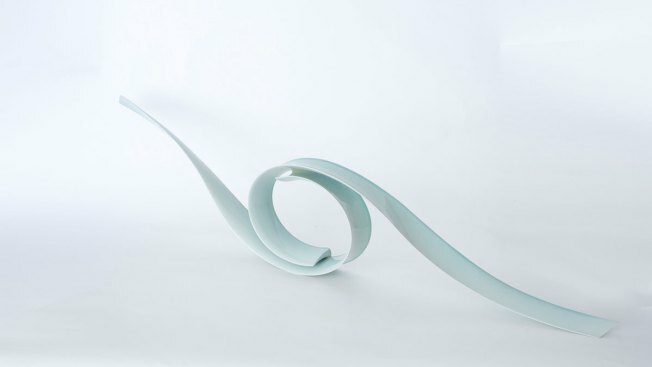 Kino Satoshi's celadon-glazed porcelain sculpture resembles an ethereal polished stone ribbon. Thanks to a unique glaze, Kondō Takahiro's sculpture glistens with sparkling dew drops cascading down the vertical piece. "He actually patented this glaze. This is his particular ‘silver mist' glaze. You can see it always looks as though the sculpture is sweating," Chao said. 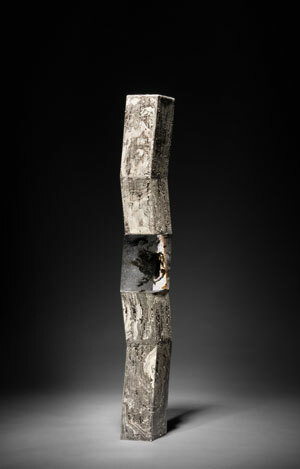 The result of Takahiro's experimentation with media, the glaze is an amalgam of platinum, gold, silver and glass frit. Complementing the exhibition is the museum's new Japanese garden. The garden features a lantern from the museum's collection and allows natural light to pour into the gallery. "This is really a way to celebrate the theme of ‘Hands and Earth' and showcase nature with the ceramics. Thankfully, ceramics are very durable, and we can have this wonderful light in the space," Chao said. "Hands and Earth: Contemporary Japanese Ceramics" is the first exhibition to open since the museum announced the Crow family donated the museum's entire collection and $23 million of support funding to The University of Texas at Dallas in Richardson. This donation comes after the recent renaming and expansion of the museum's location in the Dallas Arts District. Even with additional space, most of the museum's collection of more than 1,000 works from Cambodia, China, India, Indonesia, Japan, Korea, Myanmar, Nepal, Pakistan, Thailand, Tibet and Vietnam remain in storage. The support funding will finance the building of a second museum at the school, allowing more of the permanent collection to be on display. "In three to five years, there will be a Crow Museum of Asian Art on the campus of UT Dallas in Richardson," Hofland said. "That museum will create the Crow Museum of Asian Art, so it's one museum, two locations." Like the current Dallas Arts District museum, the second museum will be free to the public. The change represents the maturing of the cultural institution. "We've left the nest of the Crow," Hofland said. "And now we're doing exactly what we need to do, which is become sustainable with more public support."